A good rug can transform a room. I always liked having one under the coffee table in the living room. When we lived in London we were renting so we kept the furniture pretty simple but strategically placed rugs gave the room character and made it our own. A rug made by artisans using both traditional or modern patterns and colours is a good way of tying various room themes together. But the rugs don’t need to be colorful; a nice textured material can also be appealing depending on the look you’re after. Moreover, weaving is a tradition in many cultures throughout the world. Skills are passed down from generation to generation. Knowing that one of your centrepieces is ethically made – the artisan is being paid a fair wage working under good conditions, is made by hand, and has a long cultural heritage brings the room additional warmth. 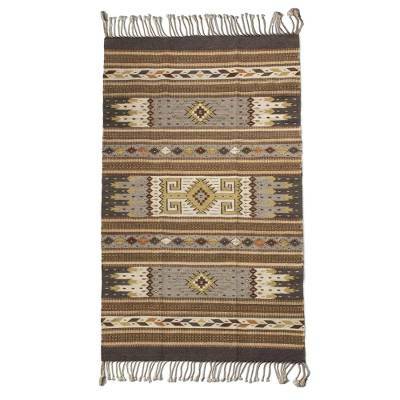 Here are 5 area rugs, mostly fair trade, made by artisans in developing countries. This rug has two things I love: bright colours and a traditional pattern. The design mixes the two in an interesting way that feels fresh and modern. Handmade and fair trade certified. 100% cotton. Sold by Myakka, a British fair trade importer and retailer. This retro-looking rug could fit into a room with mainly neutral colours, but at the same time would create an eclectic mix with other colourful decorations or paintings. 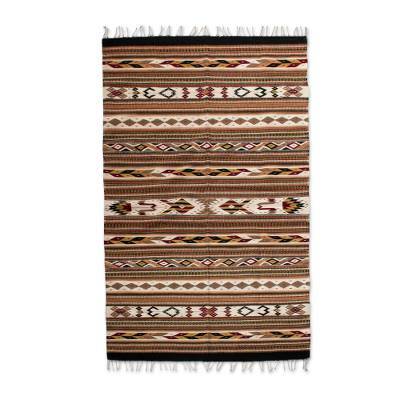 West Elm has a variety of fair trade rugs – it was difficult to choose my favourite, but I do like the bright colours in this one. Made by fair trade artisans in India. With complex patterns, I sometimes prefer a more neutral color, otherwise they can sometimes look too busy. These two beautiful wool rugs hand crafted by artisans in Mexico feature interesting geometric Zapotec patterns made using brown/white earth-toned natural dyes. Each item is individually made so there is just one of each design in stock. The Anjaya Handmade Cotton Rug has a blue and white patterned combination, with simple graphic pattern in contrast to some of the more boisterous rugs above, giving it a Scandinavian feel. Made by artisans working with a fair trade organisation in India. We showcase products made by artisans or made under fair trade conditions. Products are generally available to buy online in the US, UK, Australia or Europe. Note: Some of the links on this page may be affiliate links, meaning we receive a commission from the seller if you click through and make a purchase. There is no additional cost to you. For more information please view this page.